ENDANGERED - Blue and fin whale populations are recovering slowly but will not reach their pre-whaling numbers for another 82 years according to studies. You may be wondering why an article on whale recovery is included in our A-Z? The answer is that whale populations are indicative of the health of our oceans, and are very important because they are large mammals that feed on smaller organisms that in turn can only proliferate in the right conditions. The rate of whale recovery tells us a lot about the chemistry of the sea, just as the numbers of large predators higher up the food chain tell us a lot about toxins and patterns of growth that may be caused by climate change and acid oceans. 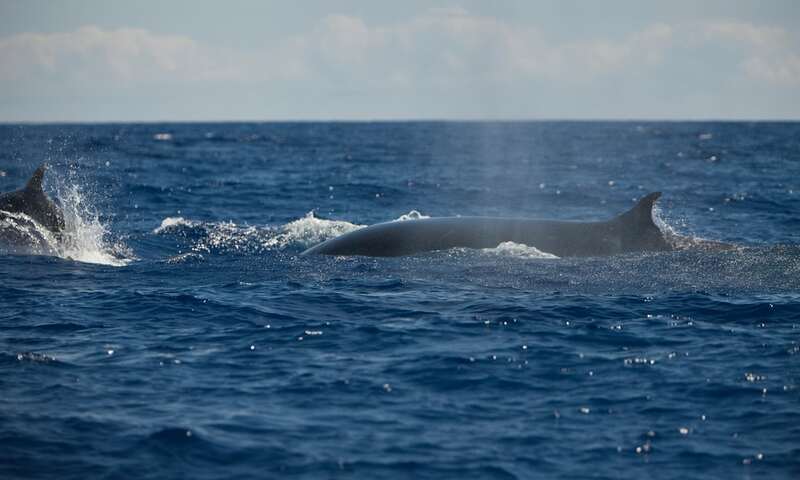 Populations of the endangered blue and fin whales, which were hunted nearly to extinction in the 20th century, will not have recovered to even half of their pre-whaling numbers by 2100, according to a new Australian study. The research, published in the Fish and Fisheries journal next month, analysed 122 years of whaling data from the International Whaling Commission (IWC) and current population survey data to project future population growth, based on predicted food availability in the southern oceans. It found that three species – the Antarctic blue (Balaenoptera musculus intermedia), fin (Balaenoptera physalus) and southern right (Eubalaena australis) whales – will have recovered to less than half of their 19th-century numbers by the start of the 22nd century, despite bans on hunting those species being introduced in the 1960s, 1970s and 1930s respectively. Humpack whales (Megaptera novaeangliae), which are currently at 32% of their pre-whaling population, and Antarctic minke (Balaenoptera bonaerensis) are expected to return to pre-whaling levels by 2050, primarily because they breed more quickly. The study said numbers of minke were slightly more difficult to calculate because of a “data deficiency” around the “scientific” whaling undertaken by Japan. A Japanese whaling fleet that spent the Antarctic summer in the southern ocean this year killed more than 300 whales. It is the first time this kind of analysis, known as a model of intermediate complexity for ecosystem assessments, or Mice, has been used to predict future whale numbers. “What our study has shown from historical whaling is that there were many species that were vulnerable to significant impact from hunting,” said the study’s lead author, Viv Tulloch, a PhD student with the University of Queensland. “Even a couple of hundred individuals hunted a year over a number of years has been shown to significantly affect populations and significantly impact their numbers. Tulloch said researchers used climate modelling to determine the productivity of the southern oceans, which determined the availability of krill and copepods, a type of zooplankton eaten by southern right whales. “We have tied the krill to primary productivity and we have tied the whales to the krill,” Tulloch said. Krill populations in the Southern Ocean are predicted to increase in the next 100 years, while krill numbers in the southern Indian and Pacific oceans are expected to decline “quite considerably”. Tulloch said the modelling did not consider other climate-related factors, like ocean acidity, declining sea ice and warming surface temperatures. The last two are predicted to have an impact on blue whale numbers in particular and will be looked at in a later study. The CSIRO principal research scientist Dr Eva Plaganyi, who supervised the study, said the information on historical whaling included recently released catch information for 100,000 whales illegally killed in the Southern Ocean by the Soviet Union between 1947 and 1973. The catch data ran from 1890 to 2012 and included more than two million records detailing the species and location of the catch. This website is provided on a free basis as a public information service. Copyright © Cleaner Oceans Foundation Ltd (COFL) (Company No: 4674774) 2017. Solar Studios, BN271RF, United Kingdom. COFL is a charity without share capital.